I can’t belive that today my son turned 1 year old. This has been the most amazing year of my life, I owe it all to my wonderful wife and of course Andrew. I have this dream every 3 months..
It’s official, Andrew can walk. Law: Employees Sue to be Paid for Time Spent Booting Up. I agree with one of the commenters. Somebody call the waaaaaaaaaaambulance. I hate how I write about something and months later the link dies, so I’m trying to keep all of it in here, not trying to take credit for it at all. If you and your spouse decide to “seperate” and facebook tell you “OMG THEY ARE SINGLE NOW” count to 10, take a walk, and not a walk to their house to cut them up and hid them in the basement.. Jeeze..
A husband who hacked his wife to death with a meat cleaver in fury over her Facebook entry was jailed for a minimum of 14 years at the Old Bailey today. Wayne Forrester, 34, drank alcohol and took cocaine before driving 15 miles to the family home to attack wife Emma as she lay in bed. The couple had separated four days before the murder in February and Forrester later told police he had been provoked by his wife changing her marital status to “single” on her Facebook entry, the court heard. Forrester, a HGV driver, admitted murder in February this year in New Addington, near Croydon. Emma was found in a pool of blood after neighbours were woken at 6.30am by her screams. Near her body was a large kitchen knife and in another room a blood-soaked meat cleaver. 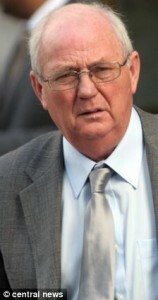 Jailing him for life, the Common Serjeant of London Brian Barker QC said: “Your wife ended the relationship. Your reaction was one of anger and resentment. “There is no possible excuse or justification. The court heard that the Forresters had a “volatile and unstable marriage characterised by periods of separation and reconciliation”. 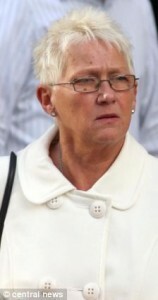 Alex Lewis, prosecuting, said that while Forrester was in and out of work and cared little for family life, his wife took two jobs to make ends meet. Her parents supported the pair financially and moved home closer to them to help their daughter. Four days before the murder Forrester moved out of the family home to stay with his sister in Paddington. He repeatedly called home and threatened to kill her. Forrester drove to Croydon armed with the knife and meat cleaver and forced the front door open. After neighbours called 999 he emerged from the house covered in blood and holding a carton of juice. Inside the house they found Mrs Forrester’s body with a large wound in her neck. Two bannister rails had been broken off and there were clumps of long brown hair outside the bedroom. She had multiple wounds to her neck and head and defence wounds to her arms showing she had fought to ward off the blows. In an impact statement the victim’s sister Eliza Rothery said the family had been devastated by the murder. Peter Dahlsen, defending, said Forrester felt “a deeply held remorse”. EDMONTON, January 18, 2006 (LifeSiteNews.com)  It would seem there is truth to the warnings against the Harry Potter series if the opening of an honest-to-goodness witchcraft school in Canada is any indication of increased interest in the occult that has resulted from the books. The new school, Northern Star College of Mystical Studies, is compared to the Hogwarts School of Witchcraft and Wizardry from the Harry Potter books by a CanWest News Service report. The school offers diploma and two-year certificate programs, open to adults only. The school teaches potions, astrology, tarot, hypnotherapy, divination, magic and other occult practices, among other subjects.